Golf Digest rated more than 6,000 courses in North America and the Islands. The courses were evaluated by approximately 20,000 Golf Digest readers. The ratings were based upon overall golf experience, value for the money, standard of service, conditioning of the course, and normal pace of play. Coyote Lakes was congratulated in the 2008-2009 edition for receiving Golf Digest’s 4-star rating in the seventh edition of Golf Digest’s Best Places to Play. The word most often used to describe Coyote Lakes is FUN. Golfers who can control their shots off the tee and around the bunkered greens only have to worry about quick bent-grass greens during our prime season. Better golfers think because the course plays 6,213 yards that they will bring Coyote Lakes to its knees. However when Arthur Jack Snyder and Forrest Richardson collaborated on the course layout in 1993, they elected to follow the natural terrain of the existing property versus using tons of fill dirt. The result was a course with an abundance of undulating fairways. The front nine is predominately a desert layout with one lake. Coyotes and other wildlife are seen frequently, thus the name Coyote Lakes. Hole number 6 on the front nine. “THE RIDGE” is very unique and memorable. It is a par five that plays only 549 yards from the back tee but 100 yards from the front edge of this elevated green is a 12 foot tall rock wall. The wall is intimidating. Many golfers have failed to clear this wall trying to go for this par 5 green in two. Many a round has been spoiled by failing to manage this hole. The back nine is a more traditional layout with 3 lakes impacting play on 7 holes. Players can master this challenging course if they can control distance and know when to manage tee shots on select holes. The GPS Industries system on every cart is like having a tour caddie with you throughout your round. This system gives precise measurements to greenside bunkers and other obstacles to par. 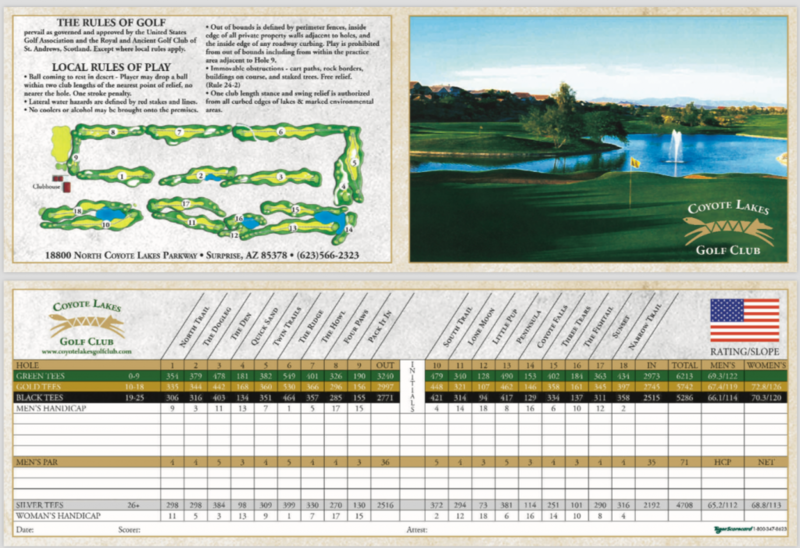 Since incorporating the system in the summer of 2007, the average pace of play at Coyote Lakes has been slightly under 4 hours. The GPS Industries system incorporates the Scorecast “live leaderboard”. This enables tournament participants to keep track of fellow competitors from each cart during the course of competition. As indicated in the 4-star rating by Golf Digest Magazine, this “Surprise”-ingly challenging golf course is loaded with amenities but yet still affordable. Coyote Lakes is conveniently located in Surprise, 4.3 miles west of the 101 freeway at 115th avenue and Union Hills, north two blocks and left on Doo Dah lane into our parking lot.